The über-engineer Keith Bontrager is credited with uttering the now-infamous aphorism “Strong, light, cheap. Pick two”. When Rockshox set about designing the new SID World Cup fork, it clearly took this motto to heart. It’s pretty obvious which of Bontrager’s three the lead engineers threw out – the recommended retail price for these forks is just shy of a grand. By anyone’s standards, that’s a decent chunk of change. 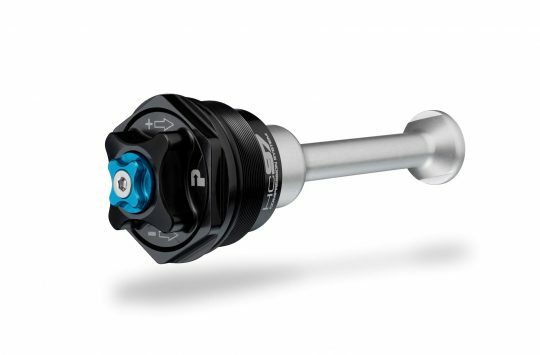 That said, it’s still a whole lot cheaper than RockShox’s own RS-1 upside down fork, which clocks in at over £1600 at the checkout. So it kind of depends on how you approach things. So what exactly do you get for your money? And is the SID World Cup any less of a fork than the RS-1? It’s your old mate SID, but he’s had a bit of a facelift. If you mention the word ‘SID’ to any died-in-the-wool XC racer, they will most likely conjure up mental images of the original bright blue model, launched in the dim distant past of 1997 (20 whole years ago!). Rockshox’s SID (Superlight Integrated Design) forks were the fork to have back then if you had any aspirations of attaining warp speed in cross country races. And for those who weren’t racers, these were the sure-fire ticket for earning all of the street cred that was worth having. Rockshox’s claimed weight for the SID World Cup forks is 1366g for the 27.5in model (SRAM doesn’t list the claimed weight for the 29in version tested). 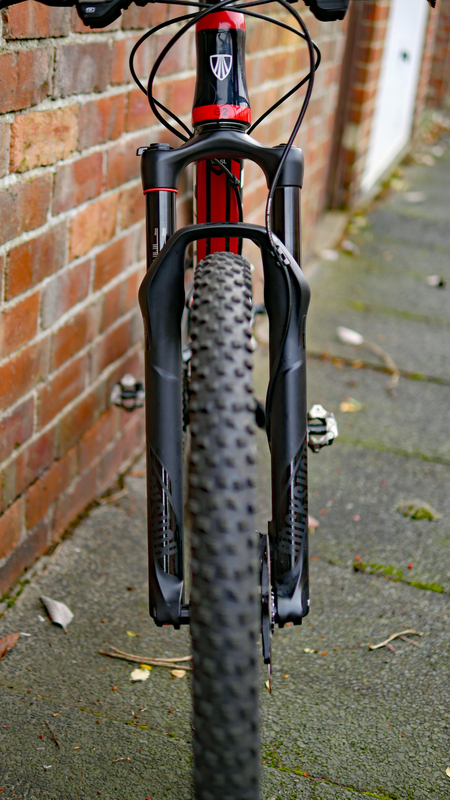 Compare this with the top of the range RS-1 fork, which is listed at 1573g (also for the 27.5in model). So despite the SID’s coming in over 700 quid cheaper than the RS-1 fork, you actually end up with a significant weight saving with the SIDs. Lighter and cheaper eh Keith? The all-bling World Cup model gets an exotic carbon fibre crown and steerer tube. The forks I’ve been testing are the 29er SID World Cup forks, set at 100mm travel and spaced for a 100x15mm front hub, though Boost spacing is also available. On my digital scales at home, the forks weighed in at 1481g with the steerer cut to 170mm and with the Maxle Stealth thru-axle installed. Compared to the pair of 2017 Rockshox SID RL forks that came off the bike (1637g confirmed), I enjoyed a healthy weight saving of nearly 200 grams. However, this fork is still heavier than the SID’s main rival; Fox’s 32 Step Cast fork, which we’ve confirmed at 1360g for a 100mm travel 29er. So the SID World Cups are light, and significantly lighter than the previous generation SID and the current RS-1, but not quite as feathery as its main rival. OneLoc remote compatible lock out. 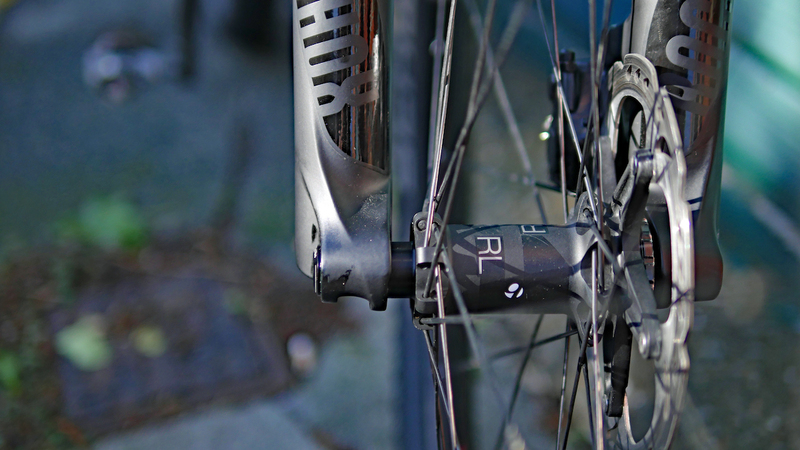 Shapely lowers get a weight-saving tooled Maxle Stealth thru-axle. You’ll need a hex key to install or remove the wheel. There’s a new-for-2017 lower chassis complemented by a full carbon fibre crown and tapered 1.5” to 1 1/8” carbon fibre steerer tube. The lower legs are heavily manipulated magnesium and come with machined (or in Rockshox terminology, “knocked out”) magnesium dropouts. 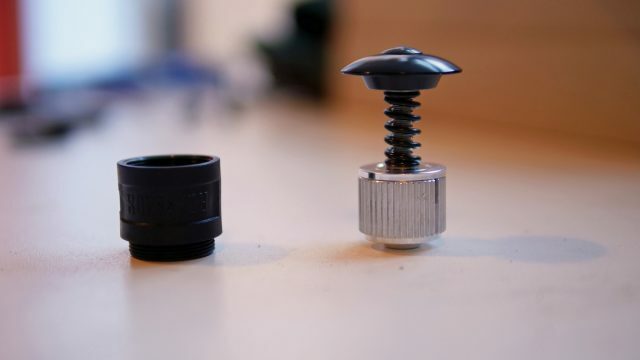 The dropouts are Torque Cap compatible – this means if you’re running a compatible front hub (SRAM, DT Swiss and Hope among others make hubs designed to play nicely with these forks) with the larger diameter end caps fitted, then you give get a much bigger interface between the fork leg and the end of the hub. This larger interface puts back in some of the stiffness and resistance to twist that the weight savings elsewhere on the fork might have taken away. Luckily for those of you without Torque Cap compatible hubs, the dropouts work fine with standard bolt-thru hubs too. There’s more evidence of fanatical weight saving attention to detail elsewhere too. 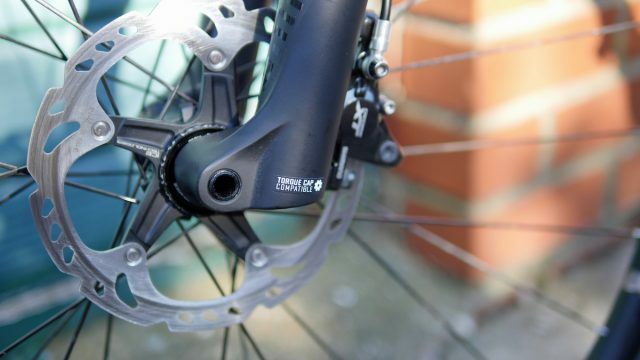 Super-stubby disc brake tabs and heavy machining on the inside of the fork leg cunningly save a few grams by allowing the disc calliper to be placed slightly closer to the fork leg than normal. 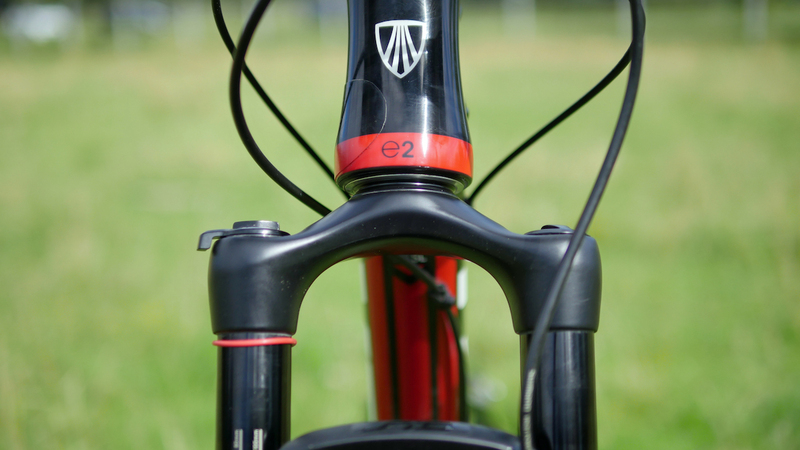 The forks are fitted with a stiffer fork arch, shorter stanchions and lower legs than previous models. Low profile top caps (which use a cassette lockring tool to remove the damper cartridge) have been fitted. With its curvaceous profile, the carbon crown is something to behold. 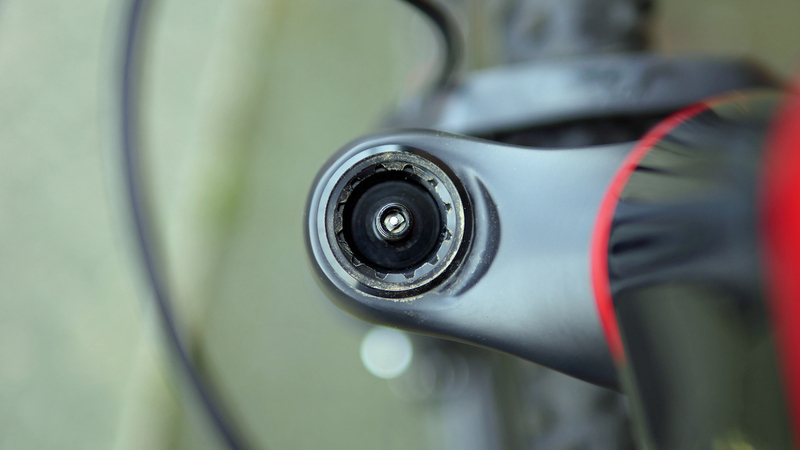 The alloy crown is bonded to the top of the crown – your headset crown race sits on top of this. The super slim fork crown appears shallower than on other models and comes with an alloy collar bonded on top of it, on which a crown race collar of your choice is to be fitted. I fitted a Hope brand split type crown race which worked perfectly and came complete with an in-built rubber seal to prevent as much crud as possible from accessing the lower headset race. 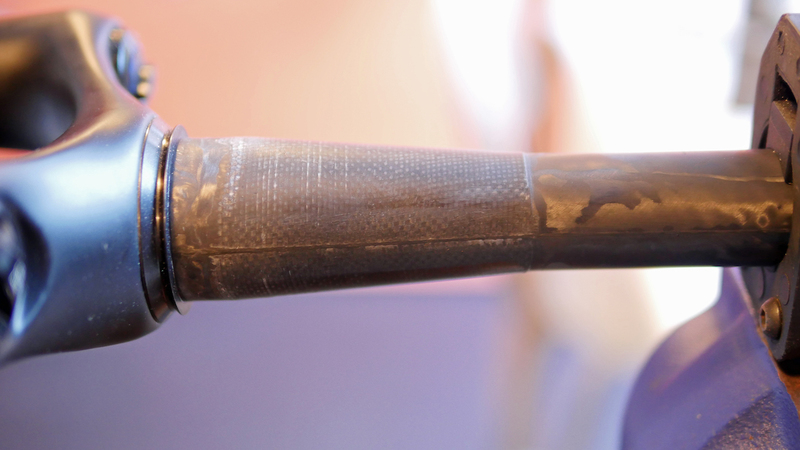 This slimmer crown undoubtedly saves a few grams, but in my view, it is a little visually odd as once fitted to your bike, there appears to be quite a large gap between the top of the crown and the bottom of the headtube. In better news for the aesthetes amongst us, one of the colour options for the forks is murdered-out-black, which look absolutely incredible. Laser cut black graphics on a matt black finish lower leg and fast black anodised upper stanchions just look the business. Even with your bike leant against a wall, these forks somehow give it the impression of looking faster. The new Charger damper is brilliant. Adjust low-speed compression damping with the middle dial. Rebound damping is controlled at the base of the right fork leg. For the 2017 forks, Rockshox has fitted an XC-tuned version of the damper taken from the well-respected Pike suspension fork. The damper cartridge has been on a diet to allow it to be fitted inside the walls of the skinnier 32mm diameter stanchions of the SIDs. 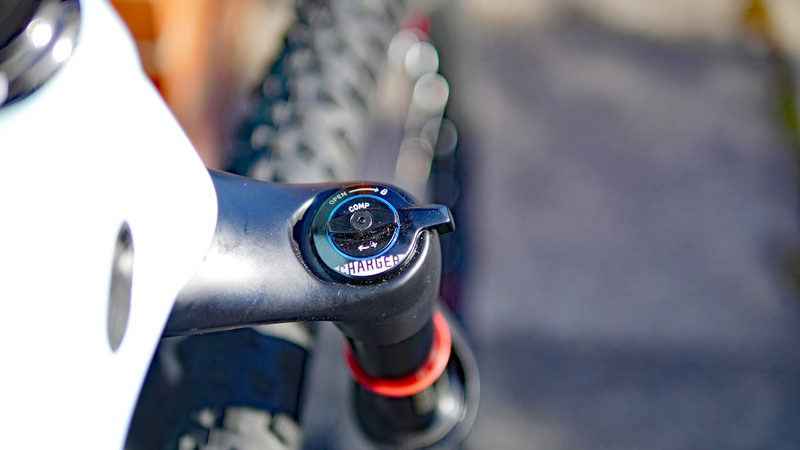 The new Charger damper provides two modes – full travel or locked out. 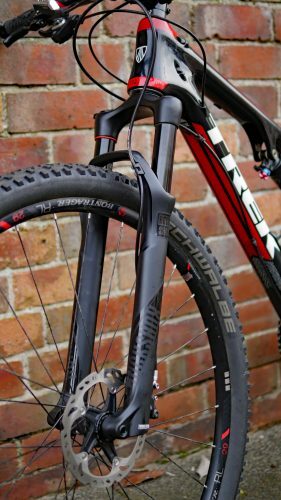 This latter mode is heavily damped and super firm, but has an inbuilt blow-off function to prevent damage to the fork if the rider forgets to switch off the lockout and then hits a particularly rocky section of trail. Low speed compression damping can be altered using an in-set adjuster fitted into the centre of the fork lockout. 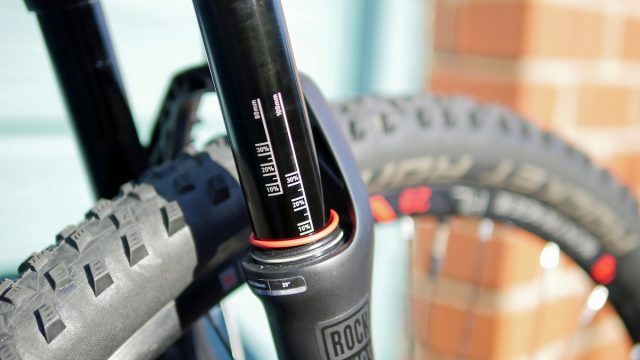 The fork lockout is compatible with Rockshox’s OneLoc remote, but for the ultimate weigh savings, the lightest option is the crown-adjusted dial used on our test fork. Rebound damping is controlled in the normal way with a knurled adjuster fitted at the bottom of the right-hand leg. A single valve is all you need to adjust to set air pressure. 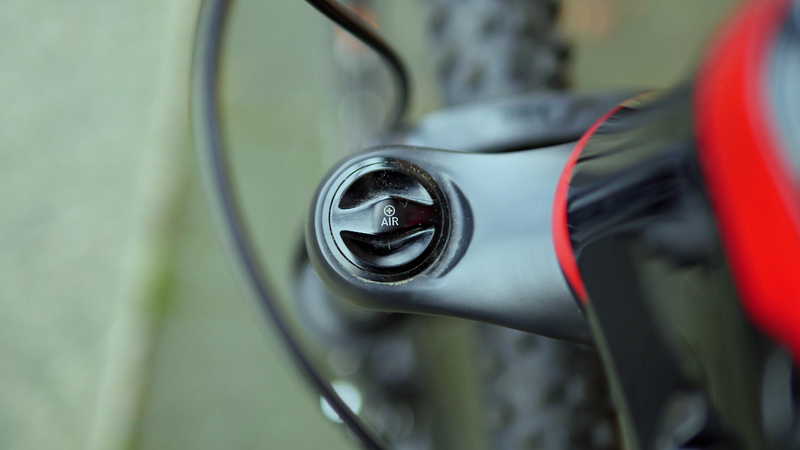 For the new low-profile top caps, RockShox has moved to a cassette lockring interface. No more shaved-off sockets required! As expected, the new SID World Cup forks are entirely air sprung. The spring, Rockshox’s Solo Air design (which allows both the negative and positive chambers to be filled simultaneously), is based on a cut down version of the one found in the much burlier Pike, but has been tuned for cross-country to provide a more linear feel than previous versions. For the vast majority of the target market for these forks i.e. racing snakes, the forks will run perfectly straight out of the box. For slightly more, ahem, padded (or hard riding) potential owners, the forks can be fitted with up to four of Rockshox’s Bottomless Tokens to prevent the fork from blowing through its ravel too easily. The fork comes stock without any tokens installed, though one is included in the box for those who want to experiment. During the test period, I ran the forks without the token added without any issues. 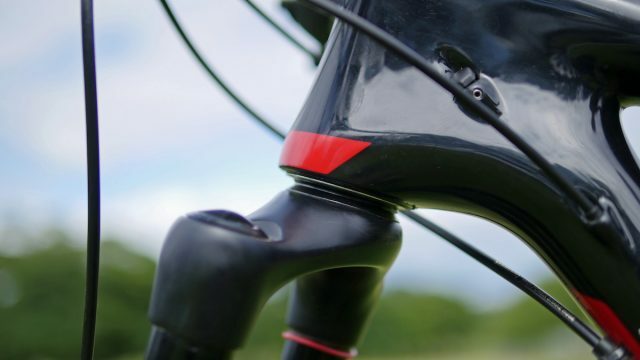 Air pressure is altered in the standard way using a Schrader type valve located under a screw top cap on the top of the left fork leg. 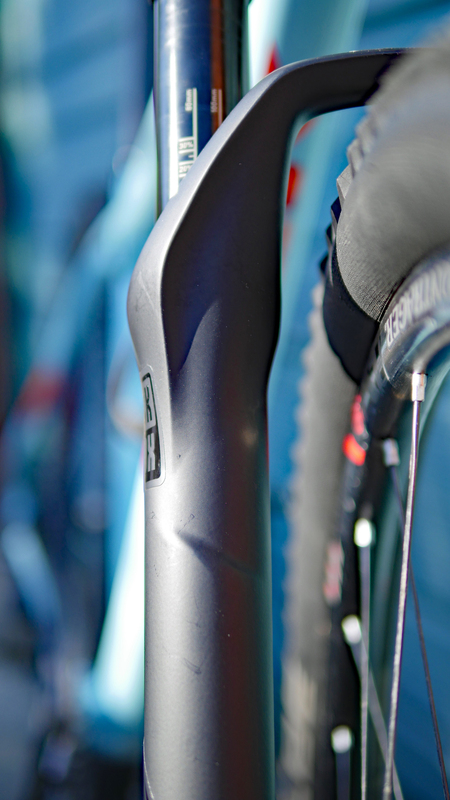 Fork sag and travel settings are printed onto the left-hand stanchion and recommended fork pressures for different rider weights are printed on the back of the upper left fork leg. It makes setup very simple and hassle-free. The SID comes setup with no Bottomless Tokens inside, though one is included in the box along with the expander plug for the carbon steerer tube. 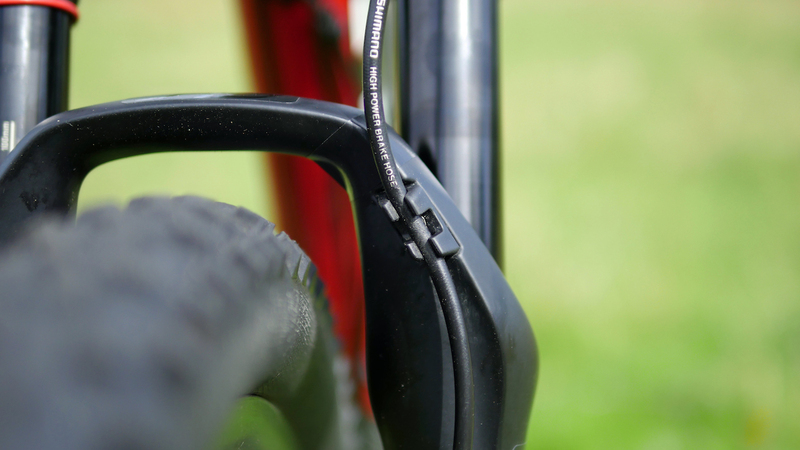 Our test fork is 100mm travel, though you can get the SID in 80mm and 90mm travel options. In general, I’d say my riding style favours more finesse and careful line choice than steamrollering my way down a trail, and the SID complemented my riding perfectly. I’m somewhere around 67kgs (10.5 stone) and with some careful tweaking, I found the sweet spot of set up for me was running the fork at 60PSI, with six additional clicks on the rebound damping from full fast, and two additional clicks on the compression damping from full open. At the risk of damning it with faint praise, I barely noticed the fork at all during the test period – but trust me, that’s a positive. The SID coped admirably with everything from super smooth, warp speed woodland singletrack to mega technical rocky trails in the Cheviots and the Peak District. Straight out of the box the fork was plush over gentle stutter bumps, damping trail chatter perfectly. It was noticeably plusher than previous models of SIDs that I’ve ridden and raced on. To subject you to a clichéd (and often well overused) marketing term, the SIDs were actually buttery smooth with no obvious stiction or notchiness through the travel. Compared to the previous SID model, the new version offers a noticeable improvement in both sensitivity and control. The hose guide is very clean. Notice the substantial tyre/mud clearance through the archway. If your hub is Torque Cap compatible, the design offers an increase in stiffness between fork dropouts and the front wheel. Now XC racers (and XC riders for that matter) also need a fork that works on the climbs as well as the descents, and the SIDs proved to be easily up to the job here. With some low-speed compression damping dialled in, there is minimal diving when climbing or when sprinting out of the seat. I’m a big fan of clutter-free bars, so go somewhat against the current fashion trend and don’t run remote lockouts on either of my XC race bikes. With these forks though, the on-leg lockout was super easy to reach and operate, and I ended up using the lock out significantly more than I thought I would – often, not because I needed it, just because I could! Not all trails are fast or smooth, so I gave the forks some flat-out hammering on more technically demanding trails too. 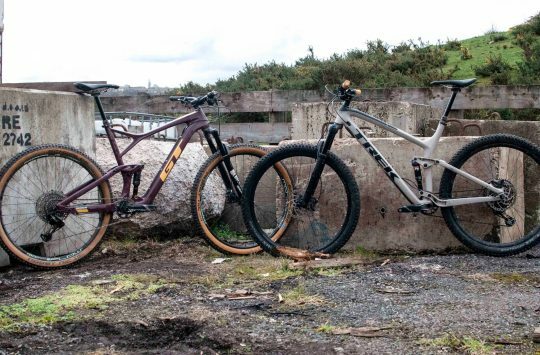 I fitted the fork to both a lightweight XC race hardtail and a short travel full-suspension race bike to see how it handled the difference in speed and more aggressive line choices that the full-suspension allowed me to get away with. The fork coped admirably with the bigger hits. I got maximum travel a couple of times a ride, but even on the limit, the travel was controlled and smooth, and I always seemed to end up just shy of bottoming-out. Despite the weight drop, the SID chassis remains impressively stout. In terms of stiffness and deflection during heavy braking or turning, these forks are superb. I had the luxury of testing the SID with both regular 100x15mm thru-axle hubs, and also one with the oversized Torque Cap design. Even when I was using hubs not fitted Torque Caps, the forks track precisely and deflected unwanted movement admirably. However, with the Torque Cap compatible hub, steering precision enjoyed a noticeable improvement due to the extra surface area afforded between fork and wheel. If you’re able to, I’d recommend pairing the SID to a Torque Cap hub. For such a lightweight overall package this combination of stiffness when you need it, but plush suspension action when you want it is certainly a winning one. As a direct comparison (and the one you’re probably all wanting to know), the SID certainly feels more robust than the Fox 32 SC fork, which is to be expected as Step Cast chassis that Fox uses can be a little ‘bendy’ when pushing hard. And bear in mind the Fox is a good bit lighter than the SID. In terms of how the fork uses the travel, I’d say the Fox is a little more supple and a little more progressive overall, while the SID offers more damping and steering support throughout the travel. We’re splitting hairs here though, and both forks are certainly excellent choices when it comes to high-end XC racing forks. 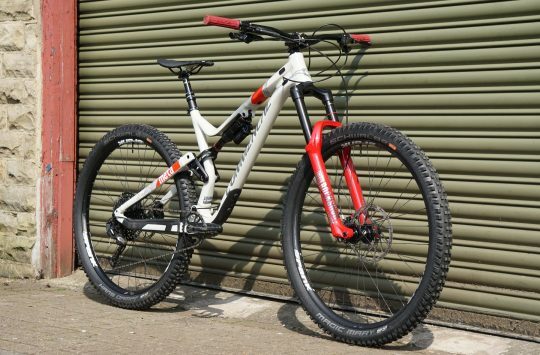 Tested on both a hardtail and a full suspension race bike, the new SID World Cup impressed me from start to finish. Thanks to chassis improvements and the addition of the brilliant Charger damper, the latest SID fork is a substantial step up from its predecessor. It’s lighter, smoother and more responsive, and the adjustability afforded by the external damping dials and internal Bottomless Token system offers the ability to really fine-tune the fork’s behaviour more closely to your liking. The World Cup model is no doubt a lot of coin for most riders. 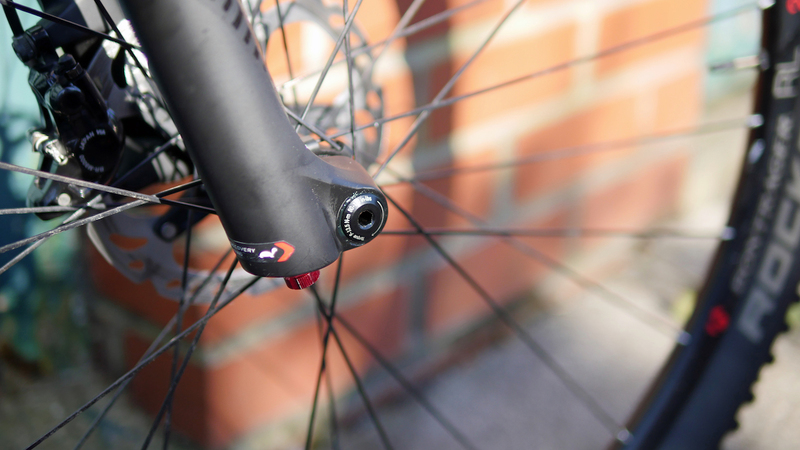 However, it’s still a boat-load cheaper than the RS-1, and in our experience, the SID is a better fork in almost every way – it’s lighter, stiffer torsionally, and it doesn’t require a special hub. It’s also far less of a pain to re-install the wheel compared to the independent legs on the upside-down RS-1 fork that make lining up the axle an absolute faff. And so for us, choosing between the RS-1 and the SID is a no-brainer. Oh and if you’re looking for any proof there, just take a look at the current XCO World Cup circuit and see how many SRAM athletes are choosing to ride SID forks rather than RS-1s. If cost is more of a concern though, consider the SID RLC model, which loses the carbon crown and steerer to drop the price down to £797. Or if you don’t need quite as much adjustment, the SID RL still comes with the same chassis, Solo Air spring and Charger damper with a simplified ‘Open/Lock’ compression adjuster for £631. Either way, you’ll be getting yourself a high quality and high performance XC fork that puts the performance of previous short-travel forks to shame.